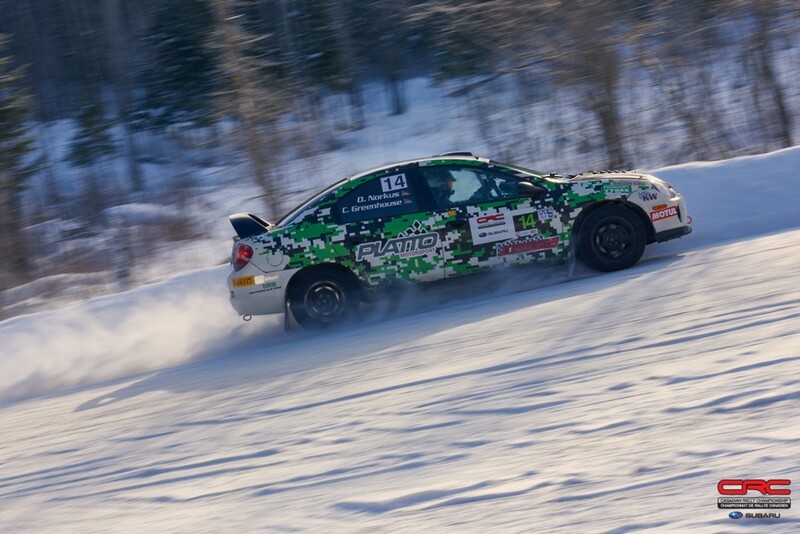 Rallye Perce Neige is held in the depths of Canadian winter, but is absolutely a trial by fire for any team who arrives in Maniwaki for the debut of the Canadian Rally Championship season. This year, of the 33 entries to start the event, 10 were former national rally winners or podium finishers. Not only would the roads and conditions serve up a challenge, but competition proved to be fierce. Much of the excitement of the event revolved around friendly rivalries among the competitors of the largest team present for the event. TEST Racing fielded five cars, three of which were piloted by crews among the top ten. Karel Carré and Samuel Joyal had high expectations – not just their own, but those of many in the rally community. The pair have been gaining skill and speed over the last few seasons, and have benefited from the tutelage of their respective fathers, Bruno Carré and Yvan Joyal. The older generation have been on hand at events helping to coach, and offer advice to the young competitors, but for this event, they returned to the driver and co-driver’s seats to compete alongside their progeny. As the rally opened up on Saturday morning, 233kms of stages lay ahead over one long day of competition. Six short sprints made up the first loop of stages, and teams jostled for position. Leo Urlichich and Alex Kihurani emerged as the leaders, establishing a 17.9 second lead over Karel Carré and Samuel Joyal. The two teams had already opened up a sizeable margin over the rest of the field, though any mistakes would have made it easy for other teams to capitalize and move ahead in the standings. The top five heading into the first service was rounded out by Jean-Sebastien Besner and co-driver Martin Cadieux, André and René Leblanc, and Bruno Carré with Yvan Joyal. Though short, the first six stages proved definitive for Nicholas Laverdière and Vincent Trudel. The pair were caught in a snowbank during the Blue Sea stage, and hit a hydro pole head on. Thankfully, the pair were unhurt and despite efforts to repair the car, the inevitability of a DNF soon settled on the team. Meanwhile, the damage to the hydro pole forced the cancellation of the second Blue Sea stage. Local driver and a madman on ice, Sylvain Erickson had to stop after the first pass of Blue Sea with mechanical problems. He and co-driver Aaron Crescenti returned to service and worked with the team to try to repair the car in order to re-enter the event, but the return was short-lived. 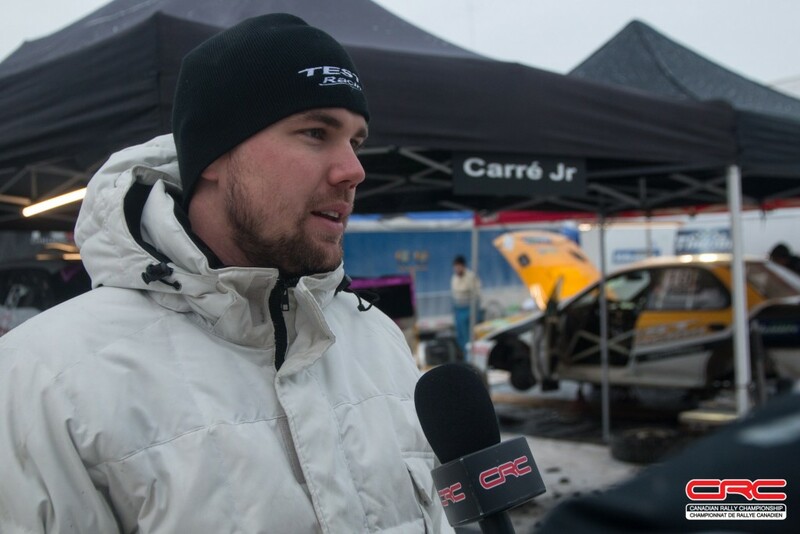 Erickson has a long career in Canadian rally, and is known for an all or nothing style, but has been defeated by an unreliable car over the last few seasons. Meanwhile, in 2WD, a new leader had emerged. Philippe Benoit and Jonathan Desgroseilliers outperformed their rivals, proving their MINI is a quick car even against the power of Chris Greenhouse’s Dodge SRT-4. “We took a conservative approach in the start of the rally that was clearly too conservative, so we’ll push on this next loop and see where we can get,” said Greenhouse. The American team had dropped to third in class behind second place Mathieu Leblanc and Éric Dubé. 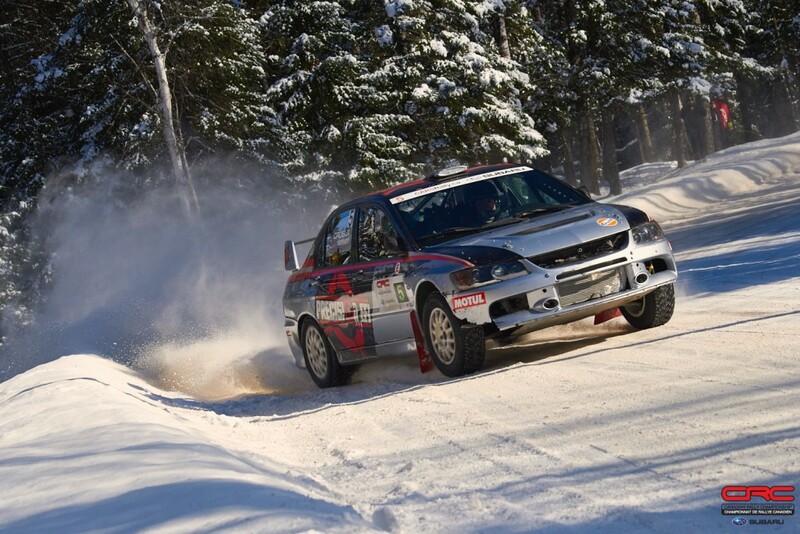 Rallye Perce Neige truly begins in the afternoon loop of stages. Made up of three long stages and two shorter in town sprints, it is the forest stages that really command respect and vigilance. The first of the loop, Kitigan Zibi, measures nearly 40kms, eclipsing the total distance covered in the previous six stages. A demanding and sometimes rough stage, it has proven decisive in past editions, and immediately had an impact on the field. Leaders Urlichich and Kihurani clipped a snowbank and rolled the car. Sliding on the co-driver’s side, a window broke and the cabin filled with snow high enough to cover the thighs of the driver and co-driver. Once righted, the team continued and scooped out the snow at the end of the stage. Despite the setback, the team only dropped to fourth overall. Karel Carré and Samuel Joyal blasted their rivals, taking a lead of nearly two minutes, but suffering mechanical problems for their efforts. Similarly, other teams struggled with problems on Kitigan. Jean Sebastien Besner and Martin Cadieux had two flat tires, costing a great deal of time to repair on stage. Damage to the catalitic converter left the car down on power and the team down the leaderboard so far they opted to retire from the event. Bruno Carré and Yvan Joyal also had to stop for a flat tire dropping down to ninth position, more than six minutes back from their sons, leaders of the rally. 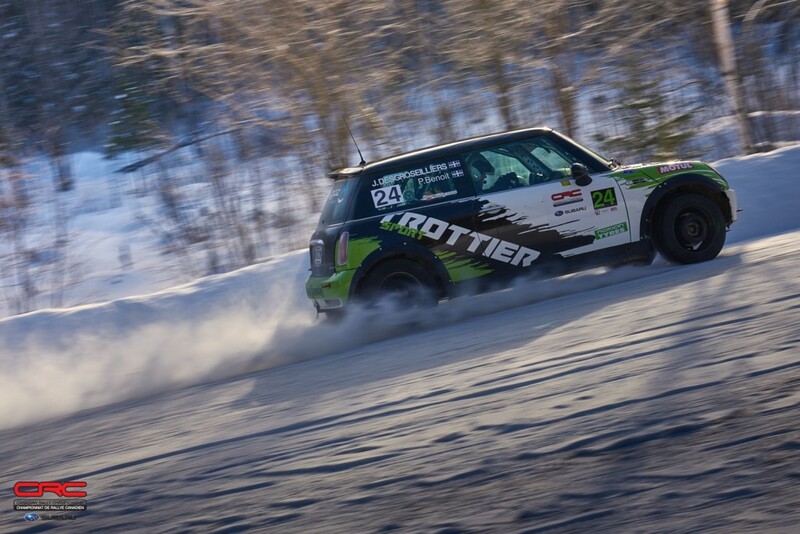 Chris Greenhouse and Danny Norkus did put on a charge on Kitigan, passing two cars on their way to a fifth fastest stage time overall, despite this, they was unable to take over the class lead from Benoit and Desgroseilliers, who held on to seventh overall. Max Meconse and Cindy McCarron proved to be the fastest production car through Kitigan, finishing the stage seventh fastest overall. It would prove to be a highlight for the team who later had troubles and tumbled down the standings. By the time teams had arrived at the second service, things had shifted across the standings. Urlichich and Kihurani had fought back to second place overall. 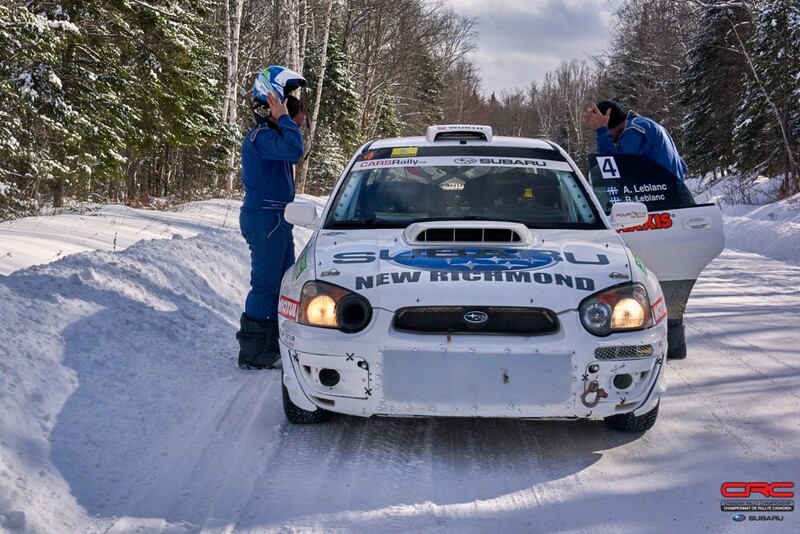 André and René Leblanc had taken a cautious approach to their rally. Poor results at Perce Neige in the past have always kept the team off the podium, and they were determined not to make the same mistakes of previous editions, balancing speed against safety. It was a strategy that was working, as the team was third overall. A slow start to “get the rust off” had left Chris Martin and Brian Johnson well down the order at first service, but they found their rhythm and moved into fourth place by the second service, in large part due to a third fastest time in Kitigan Zibi. Simon Vincent and Hubert Gaudreau were also rewarded for a clean run, rounding out the top five, ahead of Bruno Carré and Yvan Joyal. By this point, Greenhouse had blasted into the lead of 2WD with nearly four minutes advantage over Leblanc and Dubé. Benoit and Desgroseilliers lost precious minutes stuck in a snowbank and were a further 37 seconds back. On the final loop of stages, teams started with the short Marie Anne sprint in town before heading back to the forest stages. Once again, the long Kitigan Zibi proved definitive. A tweet sent from Greenhouse told the tale. With Greenhouse and Norkus out, but ok, the 2WD battle shaped up between Benoit and Leblanc. Benoit and Desgroseilliers put on a hard charge beating their opponents over the final three stages, but it was not enough, and Leblanc and Dubé won the class to stand atop the podium. Kitigan again played havoc for Urlichich and Kihurani. 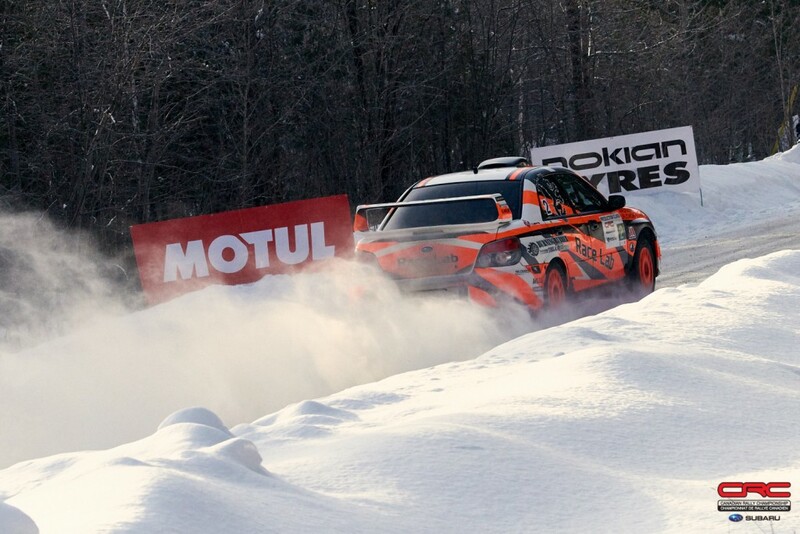 The pair got a flat tire, and struggled in deep snow and cold temperatures to replace it, losing time and dropping back to fourth overall. Once underway, the team passed Karel Carré and Samuel Joyal, stopped to fix their own flat. 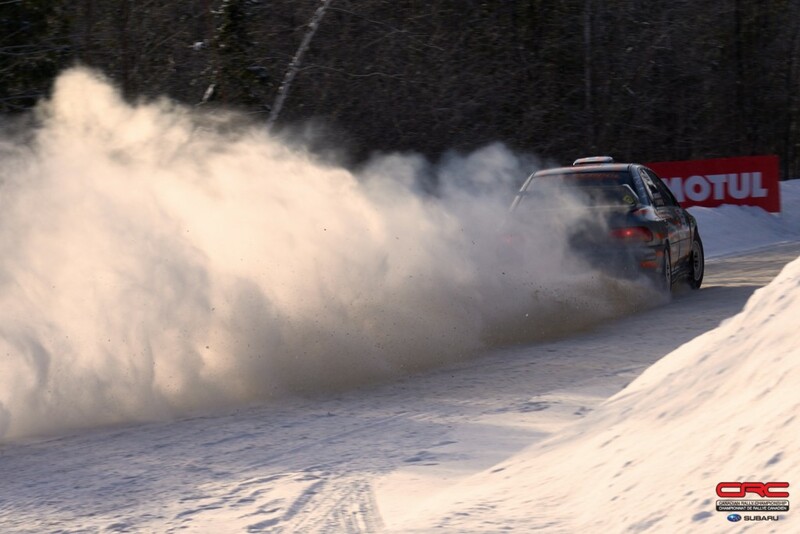 The rally leaders lost time, but managed to maintain the lead despite the slow down. Again, Vincent and Martin moved up into podium positions. Kitigan was devastating for the Leblanc brothers, who suffered two flat tires on the same side of the car, and troubles getting restarted. The pair eventually finished sixth overall, their podium dreams in tatters. Back on four full tires, Urlichich and Kihurani renewed their push for a podium, eventually arriving at the finish control with a slow leak in one tire, but with scores that moved the team ahead to second place. “We lost five and a half minutes with the puncture,” said Urlichich. “Then of course the challenge of having the car full of snow, and not really having notes. Simon Vincent and Hubert Gaudreau dropped to third as Martin and Johnson were knocked off the podium to fourth overall. Standing atop the podium at a national rally for the first time in their careers, Karel Carré and Samuel Joyal were thrilled to have overcome so many challenges and outperform the field to earn victory. The pair were greeted by their fathers, who finished the event fifth overall. For the younger team, discussions will likely begin to plan out the rest of the season now that they lead the championship. Continue to follow all of the news from the Canadian Rally Championship here, as well as on Facebook, Instagram, and Twitter. The season resumes at the Rocky Mountain Rally, in Invermere, B.C., May 25-27.